note: I wrote this post before going on vacation, the price could be a bit stale. Ingram Micro attracted my attention because they are an IT supply company and I had good success purchasing PC Connection a competitor when it was trading below NCAV. I thought I'd take a look at Ingram Micro and see if I could replicate the same results. Ingram Micro considers themselves a technology distribution company. They are essentially a middle man in the IT chain. They connect vendors with resellers and piece together customer solutions. If you own a small business you might contact a local sales person for a solution on building out a new IT office space solution. The local reseller might not have the expertise or connections to support the buildout on their own so they talk to Ingram Micro who sources from their 1400 vendors to provide a cost competitive solution. The reseller can also offer financing options and support options all provided through Ingram Micro. In a previous post I discussed when to sell a net-net and I made the differentiation of buying a net-net on an asset basis, or on a cheap company basis. When taking a look at Ingram Micro I would consider buying them on a cheap operating basis and using the net-net value as downside protection. The reason I make this distinction is that IM needs to have a large inventory available and will usually carry a large amount of receivables as part of how they run their business. It's very unlikely that suddenly management will wind down their inventory and receivables and distribute the cash to shareholders. Instead those values could be looked at as supporting values in creating a margin of safety for a shareholder. In the worst case scenario the company could be liquidated and the NCAV or discounted NCAV might be realized, this is the downside. The company's current assets are mostly composed of inventory and receivables which is normal for this type of a business. Ingram Micro also has a nice allocation of cash, 48% of the market cap is held in cash, quite a number! There is also a small amount of PP&E that's not included in the net-net worksheet but it amounts to about $1.50 a share. As for the liabilities 78% of the liabilities are accounts payable, the rest is in debt and accrued expenses. I usually shy away from net-net companies with debt on the balance sheet but in the case of IM the debt is small and manageable. Their debt to equity stands at 18%, in the most recent quarter they paid down $120m of debt with $522 remaining. At the current rate the debt will be paid off in slightly more than four quarters. 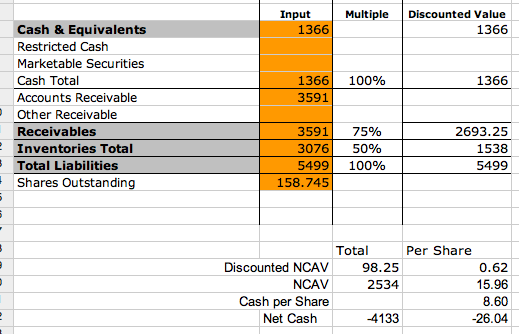 Overall this is a nice balance sheet, and it provides a lot of downside protection for an investor. One of the problems for companies in this space is that the margins are absolutely terrible, Ingram Micro has a 5.4% gross margin, 1.3% operating margin and .8% net margin. These margins are similar across the industry, but it's a bit surprising, some of the Japanese net-net's I've profiled have better margins. The company has a 3.56% Return on Assets and a 9.36% Return on Equity. Based on the differential ROE is juiced by financial leverage. Looking at the ROE through a duPont lens we have ROA * leverage = ROE. The 2.62 is the financial built into the business structure, most of the financial leverage is due to the fact that the company is carrying around a large amount of account payables. A large account payable balance is like receiving financing from your customers at a 0% rate. 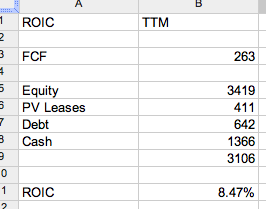 The ROIC comes out to 8.47% which is acceptable for the industry. The one thing I want to highlight from the worksheet is that Ingram Micro has $411m in operating leases that only appear in the 10-k. The operating leases are similar to debt but don't appear on the balance sheet. So on a few simple metrics the company is coming up cheap. What might be an appropriate valuation for Ingram Micro? The industry average P/E is 10.5, which if IM traded at that level they would be at $19.11, not much upside. A P/E of 10.5 plus cash results in a price of $27.75 per share. If the company traded at an EV/EBIT of 8 the price would be $32.34 which is quite a bit higher than $17.66. Ingram Micro is trading at a very cheap discount to net assets, and the business is trading cheaply as well. Even with both of those factors I don't have a good feeling about Ingram Micro. The company has a decent amount of debt and operating leases, and earnings are extremely lumpy. I also don't know how much valuation expansion exists. Clearly the company is cheap, but how much cheaper than peers. And for an industry that has bad margins maybe a P/E of 10 is warranted. If the market values based on P/E they are already close to full value. This is going into my consider further, and re-consider if it drops bin. It's worth noting they've been buying back shares as well over the years and the cash balance has been building up as a % of total assets. Even though the company has been trading at a discount for the past several years, the business looks to be in better shape today from a balance sheet perspective than it was several years ago. Perhaps the weighing machine will finally....weigh in. Is Delta Galil a magic six stock cheap?